New Delhi: Pooja Umesh, 22, is a Bengaluru-based engineer. She stopped watching television (TV) a while ago because she did not like sticking to a particular time to watch shows. Internet gives her the flexibility of watching what she wants to at her convenience. “Internet gives me a lot of options," she says, adding “if I download from Torrent, I can watch shows and films instantly". She watches Indian shows and films on Amazon. For international shows, she prefers Netflix. “I use Hotstar to watch regional language content. Amazon Prime does not offer Kannada shows," she claims. Currently she binge watches on her phone. Much like her, Shubham Agrawal, 25, a freelance musician in Mumbai, doesn’t much care for TV either. Although he watches shows on Amazon Prime and Netflix, he is not a regular subscriber to the two services. He is fond of stand-up comedy and binge watches Stranger Things, Mindhunter and This is Us on his iMac or the two phones—iPhone 6 or OnePlus 6—that he owns. While Pooja gets her news from Instagram, Shubham says he prefers Twitter and a few news apps. 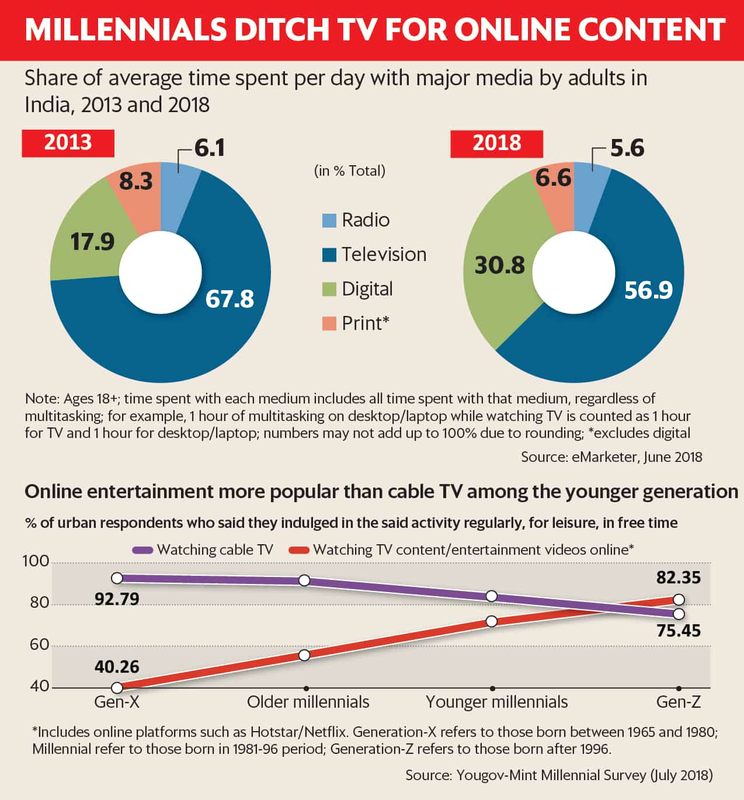 Both are part of a growing tribe of millennials who may be responsible for the slow demise of TV in India. A recent survey conducted by Mint and the Indian arm of market researcher YouGov, shows that millennials are using social media networks much more than older cohorts. It also shows that most millennials (those aged between 22 and 37 years in 2018) consume news online, with only minority of the youth watching TV news or reading newspapers. The survey also shows that the share of millennials watching online entertainment (48%) exceeds the share of those watching cable TV (43%). An earlier dipstick by Mint among 20-24 years olds in Lucknow, Mumbai, Chennai, Kolkata and Bareilly had thrown up similar results. None of the men and women contacted in this age group watched TV. Among them were students as well as those who had just joined the workforce. They claimed they stayed away from linear TV because of lack of programming and the inconvenience of appointment viewing. Experts attribute this to a structural shift taking place in entertainment—from TV to online viewing. Sameer Nair, programming veteran and current chief executive officer (CEO) of Applause Entertainment, a content production studio, says: “Not just younger audiences, the viewing shift is happening for the first 100 million viewers—the ones who first got satellite TV, first got internet, first experienced social media and e-commerce. This audience is fatiguing from the sameness of TV content over the past 18 years and seeks a change. The shift is gradual but real." Nair firmly believes that consumer behaviour is changing considering all—young and old, rich and poor—are hooked to their phone screens. “For now, this viewership is fragmented and is not monetized well enough so it appears non-threatening. But if you think about consumer behaviour, you’ll realize that a dangerous new habit is insidiously getting ingrained in hundreds of millions of us, a new habit to replace an old one." Clearly, while there may be anecdotal evidence of the shift from linear TV to online video-on-demand (VOD) services, there’s absence of statistics on cord-cutting. Cord-cutting refers to cancelling or forgoing a pay TV subscription in favour of an alternative internet-based service. Speaking to Mint earlier, Jehil Thakkar, partner, Deloitte India, said that the young may be moving away from TV but there may not be cord-cutting yet, as in a single TV household, these youngsters may still not be the decision makers. “However, these are the people who may not introduce the cord when they set up homes," he had said. In the last three-four years, nearly 30 video streaming platforms have been launched in India. This includes both the American services like Netflix and Amazon Prime Video and local brands like Balaji Telefilms’ ALTBalaji and those owned by broadcast networks like Star India’s Hotstar and Sony Entertainment Television’s SonyLIV. In February this year, TV broadcaster Zee Entertainment Enterprises Ltd launched a new video streaming platform Zee5 which subsumed its existing video streaming platforms Ozee (advertising-based) and Ditto TV (subscription-based). Zee5 comes with 1 lakh hours of content. According to Tarun Katial, CEO at Zee5, the digital consumer falls in the age bracket of 18-34 years. Without sharing absolute numbers, he says that Zee5 has seen its monthly active users grow by 2x and video views by 1.5x in the last two months. ALTBalaji claims that the platform has close to 16 million viewers across mobile phones and other devices with majority of them coming via mobile phones. Ajit Mohan, outgoing CEO of Star India’s digital platform Hotstar, meanwhile, says that Hotstar now serves nearly 150 million users a month in India. “We have the largest millennial audience for any streaming platform in the country. Of our followers, 80% are below the age of 35 years," he says. Although Hotstar audiences show massive diversity in content consumption, Game of Thrones is among its most watched show. Big films, cricket as well as local TV shows also do well on the platform. Streaming platform Netflix that launched in India at the beginning of 2016, has seen its subscription base grow at more than 40% a year. According to Tony Zameczkowski, vice president of business development, Asia Pacific, Netflix, India is clearly a nation of commute streamers, with Netflix members streaming while on the road. He says that Indians are 82% more likely to stream at 9am, a behaviour that continues on the ride home too. “Peak streaming in India is at 5pm," he adds. Advertising on digital media is all set to command 18% of the overall advertising spends in 2018 (and will go up to 25% in three years), growing at a rate of 30%. Digital media advertising is expected to touch ₹ 12,337 crore in 2018, up from the estimated ₹ 9,490 crore in 2017, according to a report This Year Next Year (TYNY) released by WPP-owned media agency GroupM. The reasons for this growth in video streaming platforms and their viewership are not hard to find. A report by global accounting firm PricewaterhouseCoopers (PwC) titled Global Entertainment & Media Outlook 2018-2022, says data consumption in India is set to grow as mobile connections reach 850 million people by 2022. With that, the country will emerge as one of the top 10 largest video streaming markets in the same period. Clearly, non-linear media is expected to grow on the back of increase in device penetration, lower Internet prices, demand for content and entertainment on-the-go. TV demands a particular time schedule, which young people find difficult to adhere to. To be sure, TV has always been and will always be household device where as mobile is personal. And hence the nature of storytelling on TV will always be “family" oriented rather than “personal" which is possible on mobile phones. Today youngsters want to be entertained with stories made for them and consumed on devices, time and place of their choice. Zee5’s Katial says: “Youngsters use online because of its inherent advantages: the convenience of VOD, gamification, variety of content and on-the-go viewing. They prefer to set their own schedules." According to Sameer Nair, online is attracting eyeballs as India missed an evolutionary step in television content. “We never had our HBO/Showtime moment; we never made The Sopranos and House of Cards; fiction TV in India has not moved beyond the daily soap operas that made their debut in the year 2000. Online VOD platforms are creating content that TV never did." Clearly, online content is high on engagement and is in snackable formats. Experts say that VOD platforms are likely to acquire scale around niches like sports, movies and English content and Hindi/Indian shows. In sports, this year the Indian Premier League (IPL) saw 202 million viewers log on to Hotstar to watch the 11th edition of the T20 tournament—a 55.3% jump from that of last year. The final match between Sunrisers Hyderabad and Chennai Super Kings saw a record 10.3 million viewers logging into Star India’s digital platform. The shift of eyeballs to streaming services is putting tremendous pressure on cable TV and direct-to-home (DTH) services. To pre-empt cord-cutting, both cable and DTH companies are proactively looking to making their set top boxes internet ready for allowing streaming services. Speaking to Mint earlier, DTH firm Tata Sky’s CEO Harit Nagpal said that his company was looking to aggregate content from streaming sites such as Hotstar, Netflix and Amazon. For the purpose, it will modify its existing set top box to enable it to get both broadband and satellite signals. Earlier, Airtel had also launched a hybrid box which offers channels alongside content from Netflix. More recently, American streaming service Netflix Inc. partnered with cable broadband provider Hathway to provide consumers access to its content through the Hathway set-top box. The set-top box will come with a remote that has a separate Netflix button allowing users to launch the streaming service. We have also joined hands with Tata Sky, Vodafone and Airtel to make it much easier for Indian consumers to watch Netflix, whether on a set-top box or on a mobile," says Zameczkowski. According to Media Partners Asia, the research firm, as of end-2017, the installed base of digital media consoles including dongles and connected STBs (set-top boxes) stood at 0.7 million. While Google’s Chromecast and Amazon’s Fire TV stick have been early movers, pay-TV and telecom operators aspiring to become gatekeepers of linear and online content are quickly joining the bandwagon. “In the next five years, India will have more than 10.8 million consumers accessing video content through connected STBs and dongles, equivalent to the number of active pay-TV HD subscribers today," said Mihir Shah, vice president, Media Partners Asia, speaking to Mint earlier. In his recent article on the findings of the Broadcast India 2018 Survey, Broadcast Audience Research Council (Barc) India CEO Partho Dasgupta said that TV is not going away, or “dying". Digital viewing is growing rapidly. But TV continues to grow, and will do so in the foreseeable future. In fact the Barc’s Broadcast India survey showed that despite competition from streaming sites, total TV viewership in the country went up by 12% from 2016. The total TV homes rose from 183 million to 197 million. The average time spent by an individual in watching TV per day also went up by 3% to touch 3 hours 44 minutes. Surprisingly, Ajit Mohan, outgoing CEO, Hotstar, does not feel that young Indians are moving away from TV to online. “The reality of India is that there is massive viewership growth happening on TV as well as online. What online streaming has done is to unleash consumers from the limitations of appointment viewing. But, even as that has happened, it is clear that they are gravitating towards the same shows, movies and sports that do well on TV. Online is actually reinforcing the centrality of TV." Adds Nair: “Linear TV will definitely co-exist with VOD in India. TV still has headroom for growth and old consumer habits fade slowly." Clearly, for the next few years, India is likely to be an “and" market and not an “or" market—homes will have both cable/DTH as well as broadband connections.